You have just entered the "Pho-dities" section. This is where I show you things that are unusual, scary, strange, or funny about the Foos that most would just ignore. A lot of the stuff on this page is kinda dated, but I like to keep it here for posterity. So show it to your kids (or pets if you're not a parent yet). They'll enjoy it (cats might try to hit the screen, and dogs might drool over your keyboard, so take the necessary precautions). Read the below and enjoy. I was listening to Madonna's "Ray Of Light" (its a good relaxing cd. what can I say?) when my favorite song, The Power of Good Bye, came on and I was singing along when I came to the chorus (which is as follows): "There's nothing left to lose. There's no more heart to bruise. There's no greater power than the power of good bye" Then it hit me. "WOAH! There's nothing left to lose...". Taylor just looks so rock star in this picture. 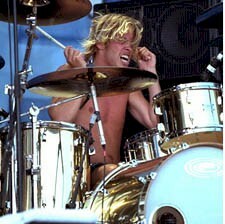 He also kinda looks like Adrian Young (drummer of No Doubt). Not face wise, but in the sense that he looks like he's either naked or wearing a fuzzy thong.